This weekend, the Kansas City Chiefs host the Indianapolis Colts in the Divisional Round of the NFL Playoffs. Local news affiliates in Kansas City are obviously getting ready for the game but, while doing so, they caught quite the spectacle taking place in KC’s other major pro sports stadium. Sports reporter Tom Martin from KCTV5 was getting an aerial shot from Arrowhead Stadium this week when the camera caught a strange sight coming from the Royals’ Kauffman Stadium next door. When the camera zooms in closer you can see what would be pretty much everyone’s fantasy who has ever turned on a gaming system—the world’s biggest game of Mario Kart on their big screen. While we’re all insanely jealous of whoever that is playing Mario Kart on a giant screen, we’re also left wondering who would have that kind of access? Is it Royals players having their own offseason Mario Kart tournament? Stadium workers with keys to the video screen? The only downside is that the screen is way too vertical for optimal gameplay. Oh well, beggars can’t be choosers. Hopefully, the footage being captured via helicopter doesn’t ruin our hero’s plans for the world’s best Mario Kart tournament. With the boom of eSports, this should be something that professional sports teams across the country could consider—massive tournaments played in their home arenas/stadiums on the Jumbotron that could be opened up to fans. Imagine a huge Fortnite tournament on the JerryWorld Jumbotron in Dallas. 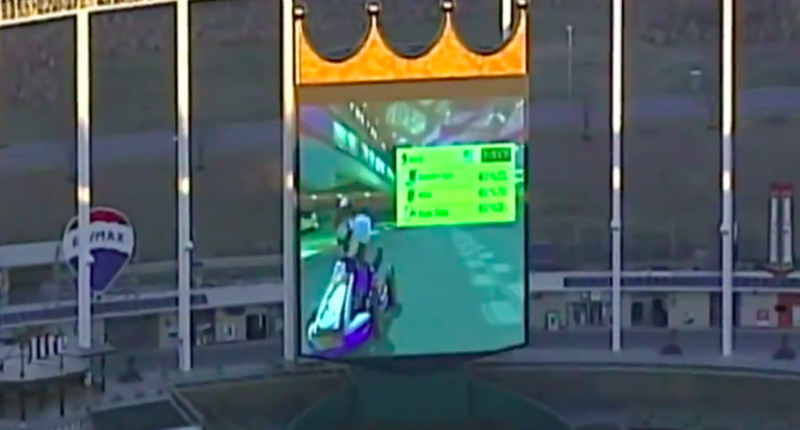 Of course, given the Royals’ 58-104 season last year, fans in Kansas City might prefer watching Mario Kart over baseball anyways.